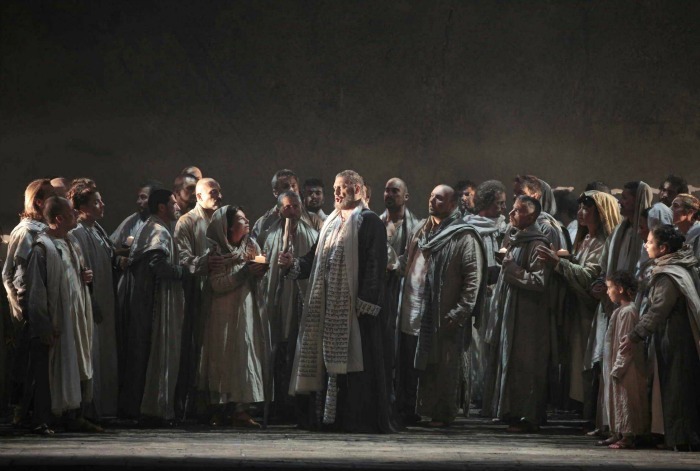 Based on both the Biblical story of Nebuchadnezzar and the 1836 play by Auguste Anicet-Bourgeois and Francis Cornue, Nabucco was the Verdi opera that put the composer well and truly on the map. This was ironic, given that Un giorno di regno had been less successful. Disillusioned with the failure of the 1840 opera, Verdi had allegedly decided to leave composing for good. However, La Scala's impresario, Bartolomeo Merelli, strongly persuaded Verdi to give composing another try. Embarking on this new project, Verdi completed the new work by the autumn of 1841. The Israelites pray as the army of Babylon advances. However, a peaceful solution may be brokered as Babylonian King Nabucco's daughter Fenena is being held hostage, kept with Ismaele, the nephew of the King of Jerusalem. The two are in love, but are discovered by the supposed daughter of Nabucco, Abigaille. She threatens Ismaele with treason unless he breaks it off with Fenena. She also attempts to bargain with Ismaele by offering to parley with Nabucco on behalf of the Israelites if Ismaele requites her love. Ismaele refuses, but furthermore, is branded a traitor after he saves the life of Fenena in the wake of an invasion by Nabucco (who appoints his daughter the regent and guardian of the Israelite prisoners). Having found out that she is not the daughter of Nabucco, a crushed Abigaille is assisted by the High Priest of Baal, who suggests that she could take the throne if he spreads a rumour that Nabucco has died in battle. Having converted to Judaism, Fenena, along with Zaccaria and his sister Anna learn from Abdallo that Nabucco is apparently dead and that Abigaille is planning a revenge campaign. Abigaille herself demands the title from Fenena, but an alive Nabucco proclaims himself to be both King and God of the Babylonians. Furious at Fenena's religious conversion, Nabucco repeats his declaration of divination, but when a crash of thunder causes him to lose his crown and his senses, Abigaille proclaims herself ruler. 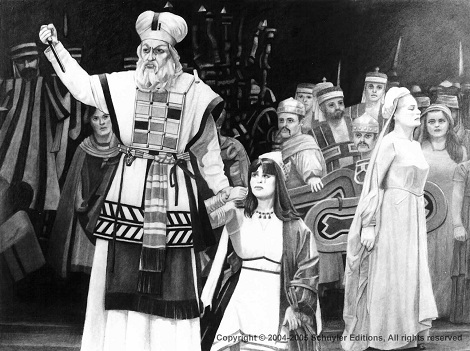 The High Priest of Baal orders the death warrant for the Israelites and Fenena, and passes the warrant onto Abigaille, who tricks Nabucco into signing it. Appalled by the truth, Nabucco also learns that Abigaille is not his real daughter. He prays to the God of Hebrews and promises that he will convert to Judaism and become a strong ruler if his prayers are answered and that his daughter will be spared. His strength and senses then return, and he implores to save his daughter and punish the wrong-doers. He enters the Hanging Gardens of Babylon, where sacrifices of the Israelites and Fenena are being prepared. Nabucco pledges to rebuild the Temple of Jerusalem and to worship the God of the Israelites, commanding the destruction of the idol of Baal. The idol subsequently falls and shatters into pieces. The Israelite prisoners are freed and a contrite Abigaille poisons herself, begging for forgiveness and God's mercy in her final moments of life. Nabucco becomes the King of Kings and the Servant of God. * Nabucco – Short for Nabucodonosor (Nebuchadnezzar). King of Babylon. * Abigaille – Supposedly the eldest daughter of Nabucco. * Fenena – Nabucco's genuine daughter. * Ismaele – King of Jerusalem's nephew and the former envoy to Babylon. * Zaccaria – High Priest of the Jews. * Anna – Zaccaria's sister. * Abdallo – Soldier of Babylon. * High Priest of Baal. Perhaps the most notable legacy of Verdi's Nabucco is Va, pensiero. Originally a hymn sung by the Hebrew slaves in the third act of Nabucco, it subsequently became an unofficial hymn of Italian national freedom. In addition, it was apparently featured in Verdi's own funeral. The message of this song, championing dignity and freedom against the Hebrews' oppression was quickly latched on as a general message of railing against oppression and striving for freedom in the face of conflict. The hymn sums up the conflicts that take place in Nabucco. In addition to the national conflict between the Israelites and the Babylonians, personal conflicts and power struggles occur between the characters. The opera provides another example of forbidden love, in this case, a romance that takes place between relations of the opposing factions (Ismaele and Fenena). It also provides conflict between the two main protagonists, Nabucco and the power-mad Abigaille. Abigaille gets some notably strong characterisation as the anti-heroine of the piece (Verdi's future wife Giuseppina Strepponi played the character in 1842). The character is provided with a diverse range of character traits from ruthless determination through to vulnerability through to her final redemption. The musical score is evocative of this multi-faceted personality, ranging from lower register menace through to a multi-octave jump. The central character of Nabucco also offers many character dimensions. Like a number of central figures in Verdi's operas, there is a streak of vulnerability between the tough shell. In the case of Nabucco, he wrestles with the revelatory truth about Abigaille's real family roots, insanity, and his own personal faith, which is put to the test in his final battle to rescue his daughter. 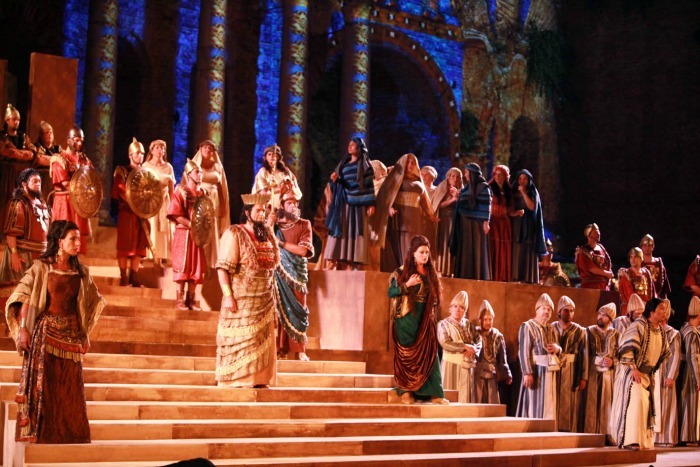 A strident, confident opera, Verdi's Nabucco spawned not only an enduring hymn of freedom but also a reputation as one of the most accomplished Verdi pieces ever composed.